Body wedges are designed to add support to the lumbar, sacral and or cervical regions; this product provides proper elevation for the head, feet and or legs. * We also specialize in Baby wedges Ask Us today! *Please note: Wedges are available in foam only, or with our custom covers. Call today for shipping quotes. For cover with zipper. Click here for cover options. * This is a temperature sensitive pad, which means that it will respond to body heat for a soft, yet supportive pad. * This pad is supportive because of it’s custom contour perfectly made to mold to your body. This pad will reduce pressure points to get that full comfort that you need and desire. This seat pad will also reduce pressure on your legs and lower back. * Can be used for wheel chairs, lazy-boy chairs, and any seating areas that are used for a long period of time. 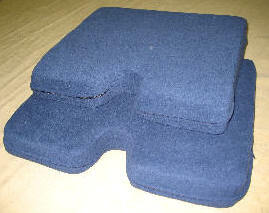 * This pad will reduce movement on the chair and helps to distribute your weight more evenly. The Terry Cloth Cover comes in navy blue, beige or white (or blue vinyl cover) and comes with a zipper so that it is easy to remove for washing. 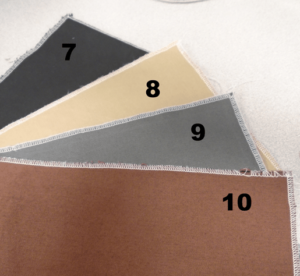 1″ of Visco Elastic Memory Foam on top and bottom with 2″ of Lux Foam in the middle. 2” Visco Elastic Memory Foam with 2” Lux Foam. 3” Visco Elastic Memory Foam with 1” Lux Foam. 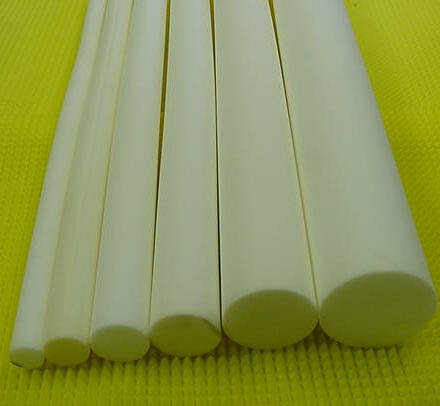 4” thick of 100% Visco Elastic Memory Foam. 2” Premium Medium Eggcrate Foam with 2” Luxury Firm Foam. 2” Premium Medium Eggcrate Foam with 2” Premium Foam. 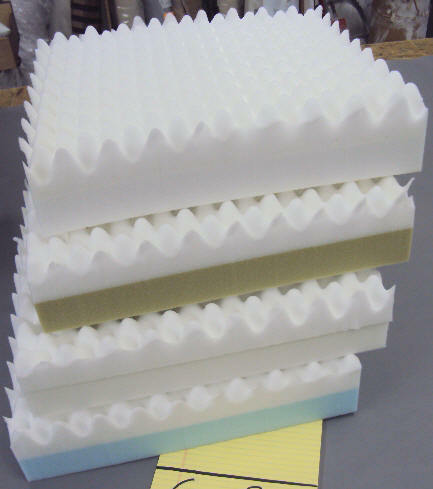 2” Premium Medium Eggcrate Foam with 2” HD23 Foam. 2” Premium Medium Eggcrate Foam with 2” Memory Foam. 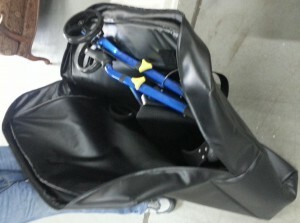 The Waterproof Seat Pad comes with 2 custom covers with zippers! 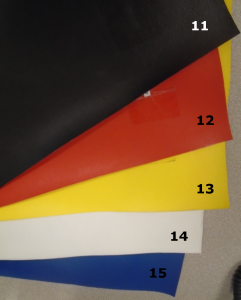 The first cover is made out of a white soft waterproof vinyl which is impervious to liquid or fluids. For the second cover Click here for cover options. Price includes covers. 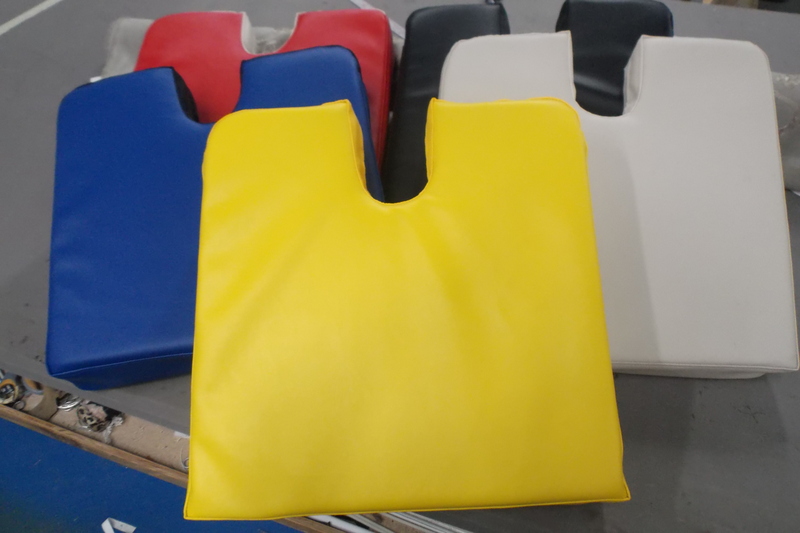 This combination will give you the support and comfort you need.This custom pad will also help to eliminate tossing and turning and provides continuous support. 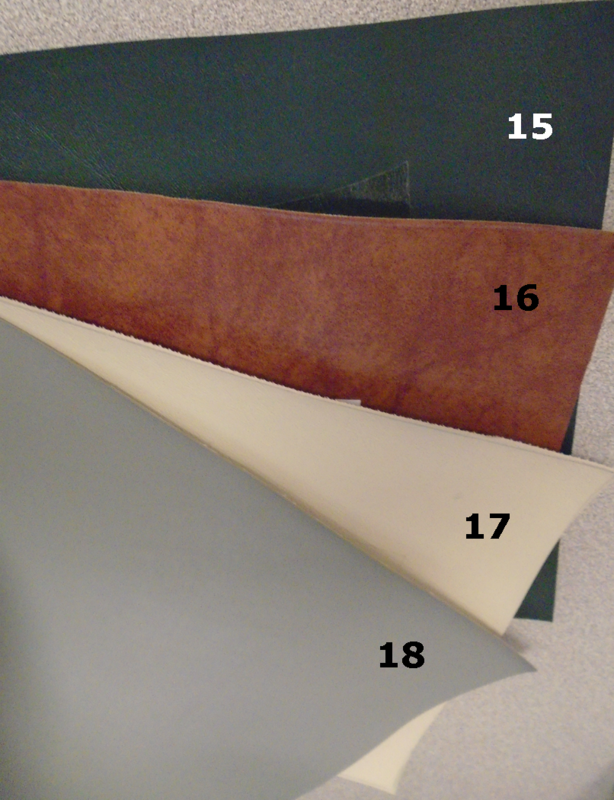 The holes in the latex provide maximum air flow, preventing moisture and heat buildup throughout it’s use. 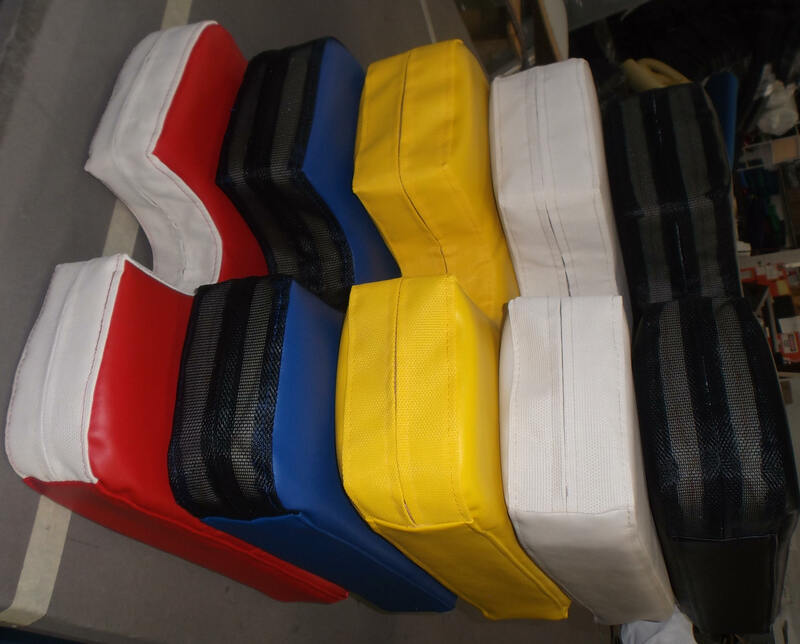 These seat pads will maintain their shape and support for years. Add $20.00 for cover with zipper. Click here for cover options. This item is designed to prevent back pain and give you good posture while cushioning the body. Gives you constant comfort that continually adjust when you change positions. 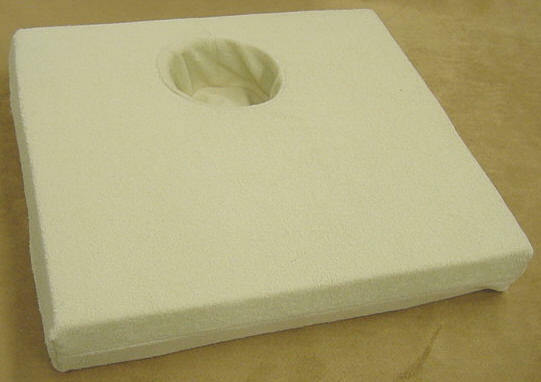 This 1” Latex foam has proven itself as an effective padding material in seat sore prevention. 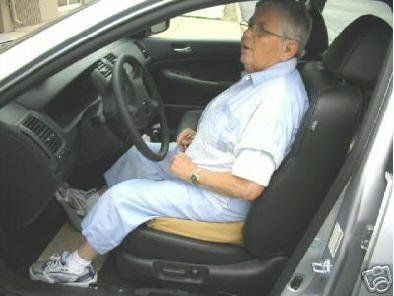 Then firm foam is put on because it will give you the support you need, so that you are not feeling the bottom of the seat. Plus in the center of the foam it has an elevated surface that also relieves pressure off you spine and keeps you in place. Recommended for Cars, Trucks, RV’s, Van, SUV’s, and Home Use. This product is a comfortable car seat wedge specially designed for the person that needs their car seat to be raised higher or needs to fill in the hollow areas for the back of their seat. This will improve spine alignment, which brings your lower back forward and strengthens your back. This seat pad keeps user comfortable in an upright position and will reduce painful pressure on the lower back, buttocks & tailbone. 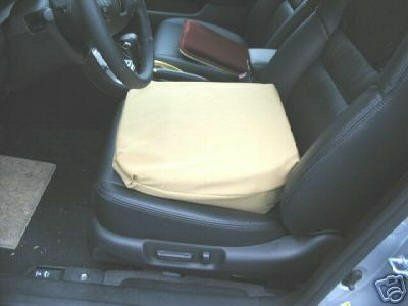 This Seat Wedge is unique because it will contour perfectly to a car, Truck, RV, Van, SUV seat without being too big, or bulky and will fit tightly into place. This will also make the seat more comfortable and will provide a healthier driving position; which will reduce stress and improve your safety. 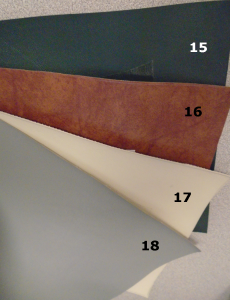 Luxury Firm Foam: 18” x 16” x 2” Pad, with a 16” x 12” x 3” Wedge wedge thicknesses- 2”, 3”, 4”, 5”, 6” thick. Remember the wedge will go at the bottom of an 18” x 16” x 2” pad. Add $ 20.00 for cover with zipper. Click here for cover options. This custom medical wedge will reduce discomfort whether it’s being used for sitting down for a long or short period of time. This cushion is scientifically designed to reduce fatigue by eliminating pressure on your tailbone. This pad also reduces pressure on the discs in your spine by suspending the tailbone over the cutout section. Add $20.00 for cover with zipper. Click here for cover options. This combination will give you the support and comfort you need so that the foam is not to soft and can still reduce and relief pressure from your spine. with 1” of Lux Firm Foam on the bottom. This Vinyl cover is impervious to liquid or fluids. This pad is deeply contoured to your body to give the comfort and support that you need for your lower back. 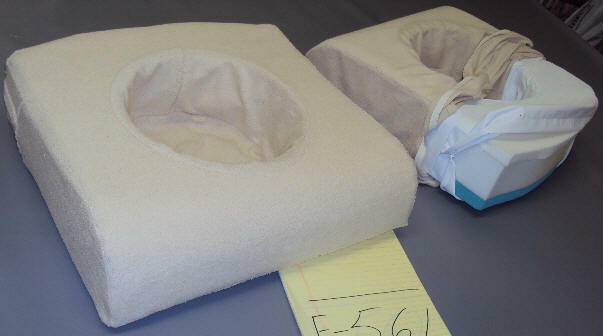 The Donut seat cushion allows you to sit with less pain in the coccyx area. It’s ergonomic design reduces pressure to the painful areas. Specifically used for people who have broken their tailbones, have hemorrhoids, or have coccydynia pain. This donut seat relieves pain from your sensitive tailbone. Please note:can be use for wheelchairs. 1” of Gel Memory Foam on top and bottom with 1” of Lux Firm Foam in the middle. 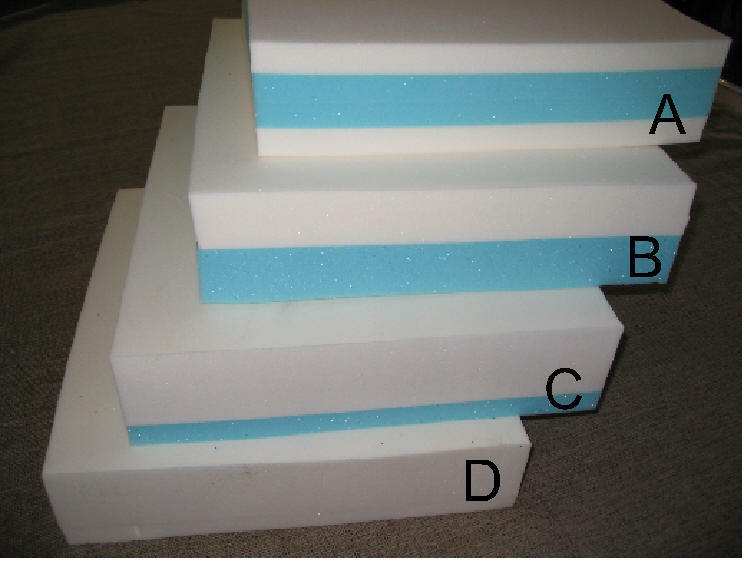 1” of Gel Memory Foam on top and bottom with 1” of Premium Medium in the middle. 1” of Gel Memory Foam on top and bottom with 1” of Tough Luxury foam in the middle. This Donut seat relieves pain from your sensitive tailbone. Please note: Can be used for wheelchair. 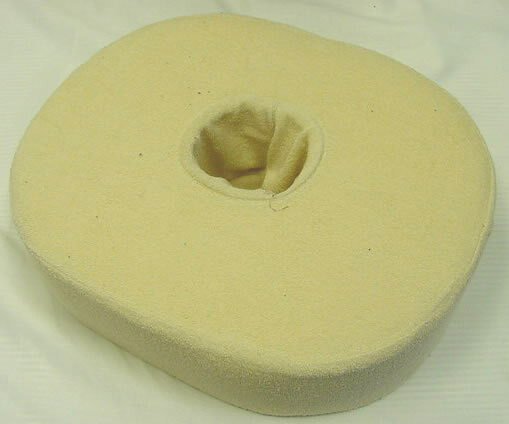 The Donut pillow allows you to sit with less pain in the coccyx area. It’s ergonomic design helps to reduce pressure to the painful area(s). Specifically used for people who have broken their tailbones, have hemorrhoids, or have coccydynia pain. 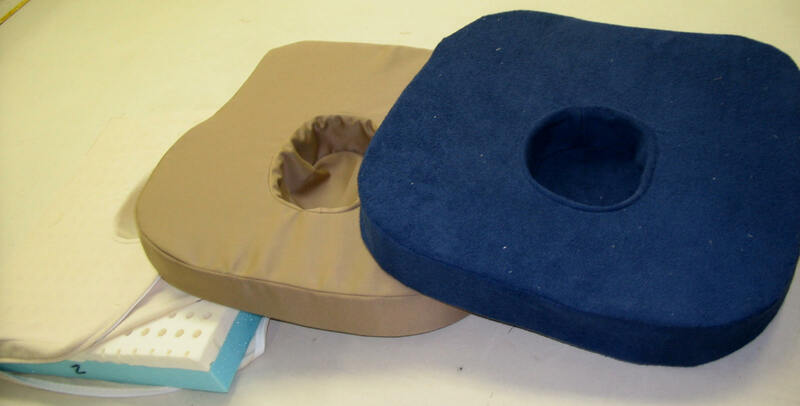 This custom Donut seat pad comes with 2 custom covers equipped with zippers! The first cover is made out of a white, soft, waterproof vinyl which is impervious to liquid or fluids. For the second cover option please Click here. Add $25.00 for cover with zipper. Click here for cover options. Specially designed for the person who must sit for an extended period of time. 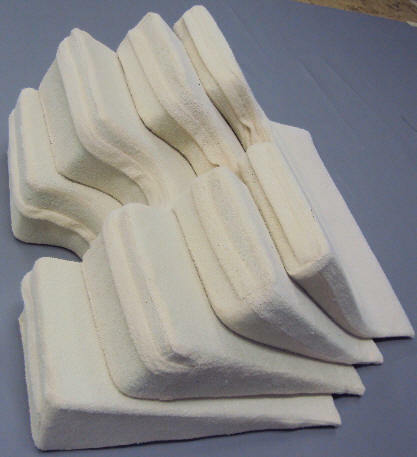 Deep Convoluted foam envelops the bony body parts, reducing pressure while preventing slippage. 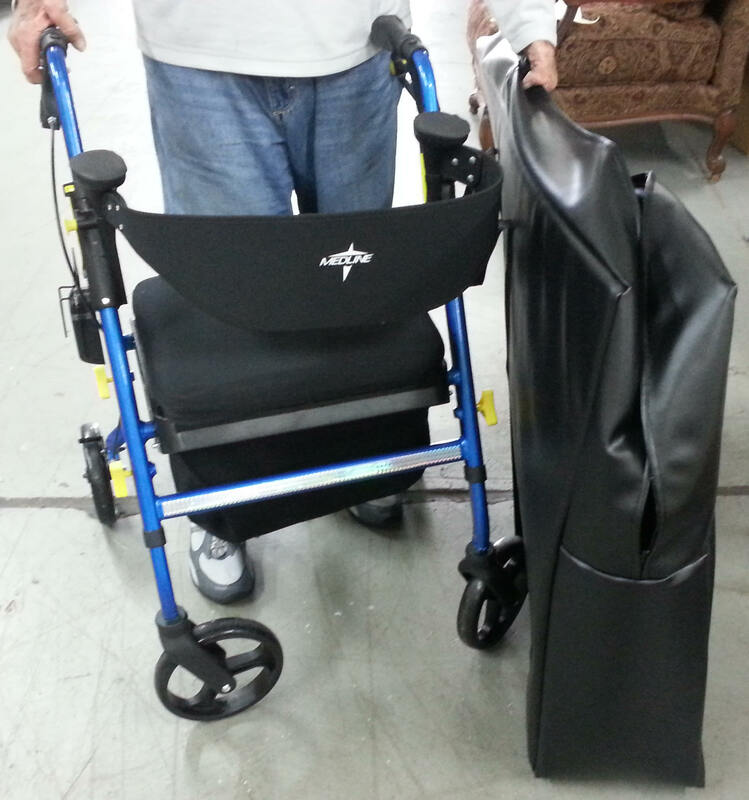 This Chair Pad keeps the user comfortably in an upright position. 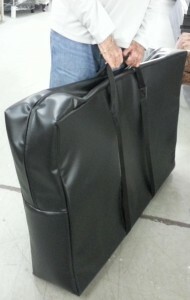 Covers Come in: Black Vinyl, Knit Terry Velour Cloth or Stripe Ticking Fabric. 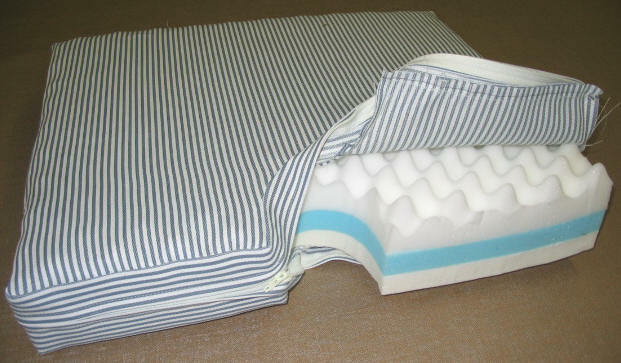 Eggcrate Foam increases air circulation, and adds comfort to the body. Designed to reduce pressure and gives a soft support. Can be used as a conventional seating cushion or on a wheelchair. Comes in HD36 or in Lux Eggcrate Foam. Please note: Customer will need to purchase 4-8 yards of 54″W vinyl to create this cover. Cost includes labor to make cover, and foam padding only. Call or email us today with your dimensions and we can get you started! Our bolsters are constructed of our Poly Foam. They can be used in whole diameter or cut in half to form two flat bottomed ‘half-moons’. They are also designed to provide additional support and comfort while in seated or laying position. Reduces neck muscle strain and naturally aligns neck vertebrae. Round Bolster, Regular Foam With Two Layers Of Batting Drapery Work Room Loves To Work With It. Adding a cover will prevent the foam from wear and tear and other damp conditions, making the foam last a little longer.